Time Zoom is a custom code extension for Autodesk 3D Max software in a script form. It elliminates the limitations of original editing components and makes usage of sofware much easier. LE version of script is FREE and provides basic elements and settings to user. Pro Version allows more precise and flexible settings and gives more possibilities. Enjoy! 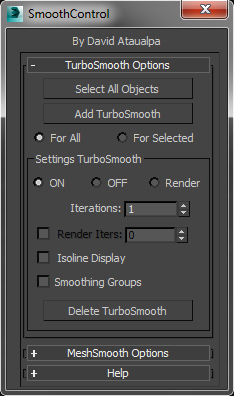 This script simplifies the editing of the textures (that are imported from Mari) within 3ds Max. It changes some basic parameters of all the imported textures. It automatically enable only the mapping slots that have textures assigned to them. A simple tool with simple interface to set a random playback start in Point cache modifier for a group of objects. to open the dialog run the script file. Drag & Drop the file inside the view-port.